Fourteen years or so ago, a dog named "Kitty" came into my life, and now she is dead. I held her head while a veterinarian injected her with poison enough to put her into a sleep from which she never awakened. The last image I have is a bit of pink tongue protruding, and the spark of life ebbing from eyes clouded over by cataracts. I did not want to do it. I resisted. I planned to do it myself, perhaps using an overdose of painkillers. I made an appointment and cancelled it. I tried to make another appointment. I made an appointment again, and this time I took her, and I held her while the man killed her. "Stop saying that!" says my wife. "You didn't kill her. You put her to sleep." "Put to sleep ... " an euphemism for euthanasia ... and what is euthanasia but a nice word for choosing to kill because killing seems right? A pretty word for an ugly act. I killed her. And I hope it was the best choice. My wife stopped by last week to pick up her ashes, and the veterinarian said, "Your husband really took that hard." A fair estimation, since I had tears running freely and had to ask for a tissue to blow my nose. "Tell him it was time," he said. "She was suffering." I am not totally convinced. She still followed me everywhere, even right out to the van that took her to place of her death, and then out of the van and into the office where I would ask the man to kill her. Granted, she had to sit after even four or five steps. She had heart failure, and she had a large internal tumor near her left kidney, large enough to appear as a protrusion on her side, and she sometimes lost awareness of where she was and what she was doing. Or so it appeared. Or so I say because I chose to kill her. "Kitty" was named Kitty because long ago I had another Boston terrier. We lived on a farm then, and like all farmers, we had barn cats. We would feed the cats a bit of raw milk to keep them in and around the barn where they worked for their living. My father would yell, "kitty, kitty, kitty," before pouring a bit of milk in an old hubcap. The little Boston terrier would hear him and run from the house to get her share. 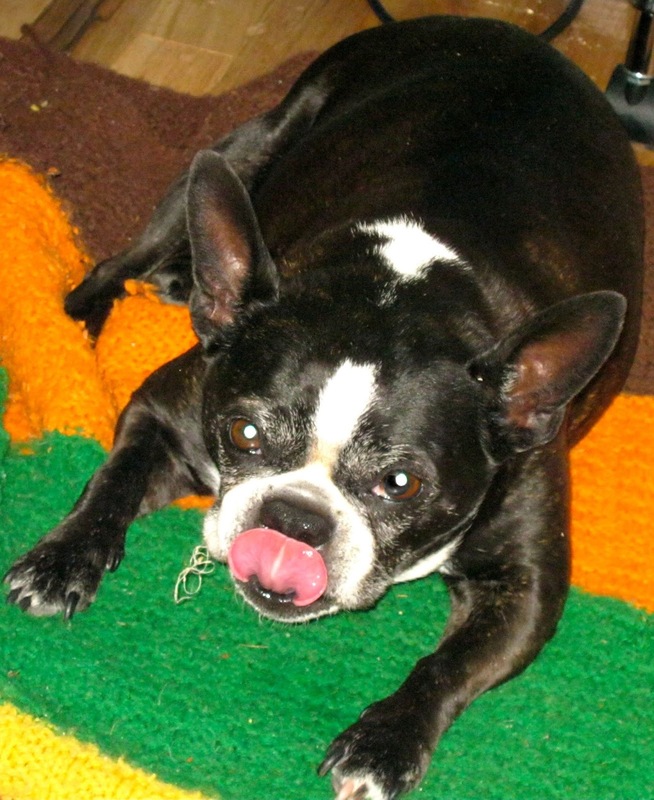 That Boston's name was Muggs, and she was killed by a truck. I didn't have to kill her. I suppose there are more unpleasant tasks to do in this life, but I've faced none recently that made me cry.